The new U.S. Army Sergeants Major Academy Historian, Dr. Everett Dague, from Kansas, and the Academy’s NCO Heritage and Education Center’s History Specialist, Leigh E. Smith, and his wife, Gretta, had lunch today at FASF Business Supporter, Ivonne Romero’s (scroll down the page at link to read about Ivonne and her renown establishment) famous Pink Store in Palomas, Mexico. Their hosts for this visit were FASF Trustees Dr. Kathleen Martin, FASF Treasurer, Alma Villezcas, and Trustee Ric Lambart, all seen in the below photo. 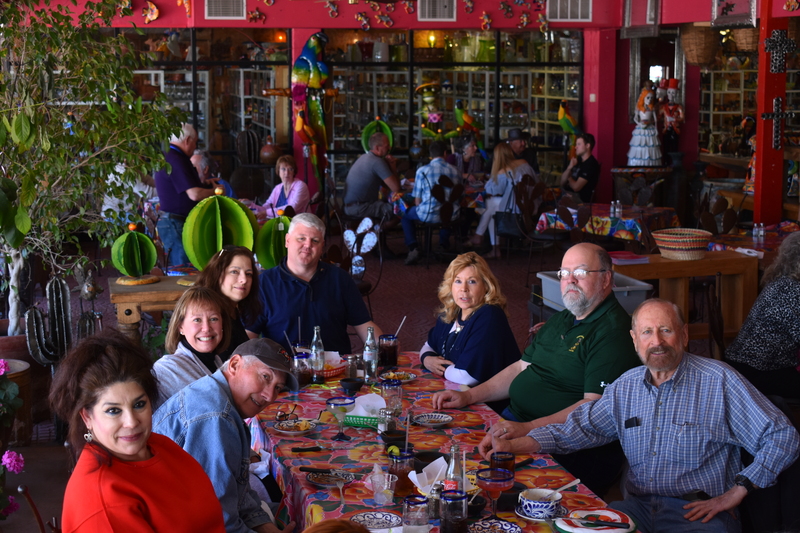 The manager of New Mexico’s esteemed Pancho Villa State Park and Director of its renown Exhibit Hall, John Read, and his wife, Elle, both long time members of the FASF, also took part in welcoming both Dr. Dague, and the Smiths to both Columbus and its sister city, Palomas, Mexico. Both Dr. Dague and Leigh Smith regularly conduct “Army Staff Rides” from El Paso’s Fort Bliss to Columbus for the purpose of teaching Army combat history to their students from the Army’s Sergeants Major Academy. Today’s gathering was to help both Mr. Smith and Dr. Dague become better acquainted with Columbus, NM, and some of the people who work with its unique history, which resulted from it being the launching place of the famous response to Pancho Villa’s raid on the town in 1916, and the resulting “Punitive Expedition,” which was launched by order of then President Woodrow Wilson. The VIP visitors from Fort Bliss gifted the FASF with some special items of historical significance regarding the Army’s Sergeants Major Academy and about the Non-Commissioned Officer’s training – – – and of their significant role in making the history of the Army itself. Remember: To see any of the FASF Site’s photographs in High Resolution, simply click on them. L to R above: Alma Villezcas, John Read, Elle Read, Gretta Smith, Leigh Smith, Dr. Kathleen Martin, Dr. Everett Dague, and Ric Lambart. The above photo is courtesy of the Pink Store! 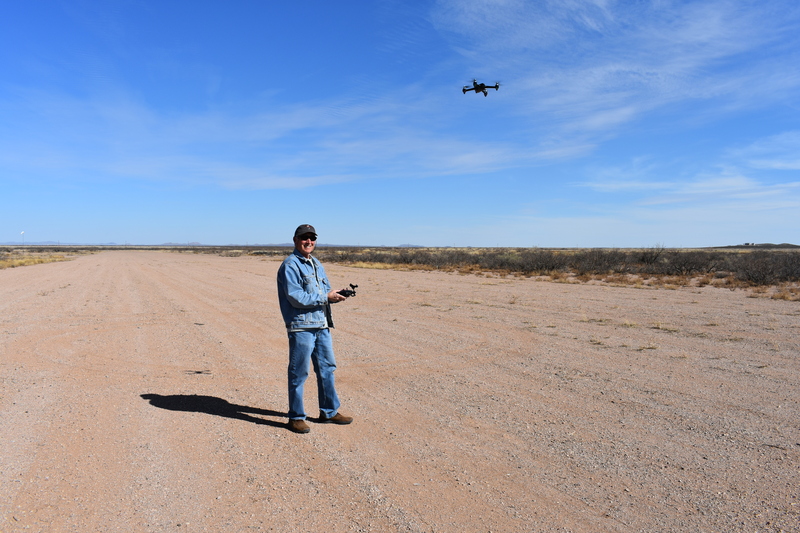 After the lunch at the Pink Store, John Read demonstated his new video camera equipped drone (see below photos) with which he plans to make new aerial views of the historic FAS 1916-17 Airfield. He launched his drone from the main East West Runway of the airfield. 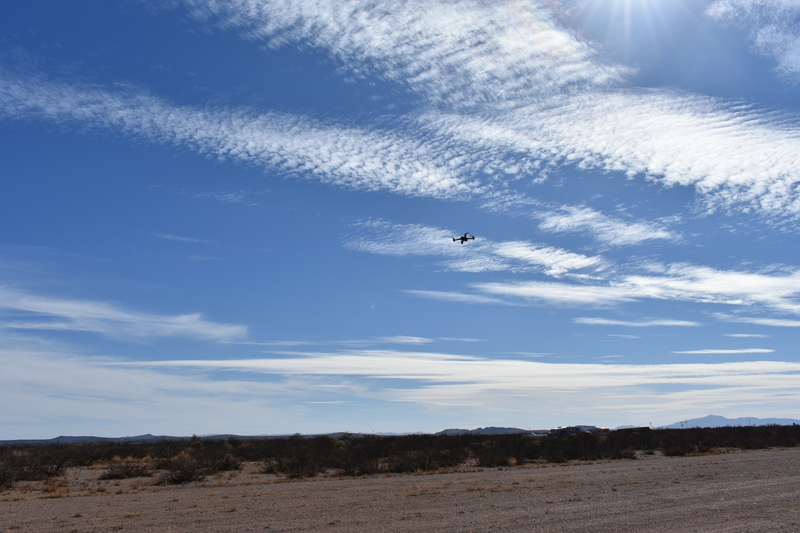 The drone’s quiet four rotor blades swiftly lifted the device so high above the runway that we lost sight of it altogether. Here it is returning by its own internal GPS guidance system. This entry was posted in HOT NEWS! and tagged Alma Villezcas, Dr. Everett Dague - Historian for Army Sergeants Major Academy, Dr. Kathleen Martin, Drone, El Paso TX, Elle Read, Ivonne Romero, John Read, Leigh and Gretta Smith Ft. Bliss, NCO Heritage and Education Center, Pancho Villa State Park NM, Ric Lambart, The Pink Store of Palomas Mexico, Trustees of the FASF on March 13, 2018 by FASFRIC.